For a month or so, our insurer has been in the news because they’re raising our self-insurance rate 39% (that’s almost 40%, which is well on its way to increasing by half…in a single jump!). People like CC and I are the smallest group of insured people–the self-employed–in California. Patients pay different amounts and hospitals all charge different amounts depending on who you are affiliated with. Those affiliated with no one or nothing pay the most by far, unless they are perfectly, proveably indigent–a state easily achieved when you have to pay for trauma aftermath, spending down to qualify for Medi-Care. Our broken system is widening the have/have not gap. Even people with little more than a roof over their head–the cartel wants it. No, it wants it liquidated ; just hand over the money. Hard to imagine change. In California the cartel pays to both political parties…and even assures that any kind of voted-for change has to pass unrealistically high standards (the 2/3 majority). But somehow, forty years ago Hawaii figured out a way to insure everyone…and it hasn’t lead to ruin. Or has it? Do I even know? An unorganized group (we’ll call them ‘citizens’) cannot match the spending and PR power of the cartel. So the once-useful tool to rout the corrupt railroad barons, etc has now become a tool for the very villains that the tool was designed to rout. Hence, “Anathema”. We shrug, and hand over all our assets, earned by the month. This is to keep them from forcing us to sell the hovel. Superb business, no competition…. No matter what you do, you are paying them. Incrementally, the way a smoker courts death on the installment plan, or all at once, when you have an accident, and have to spend down. It is true we all die anyway. It would be grand to deny them our hovel, though. These days I want to not bother being insured, CC won’t think of it. We have debates. One thing is for sure. We are changing companies, even if we can’t avoid paying even MORE per month. With Anathema, you got absolutely nothing on the plan we had. It was simply a payout to prevent house-grabbing. With Kaiser, you actually are paying for doctor visits and stuff. 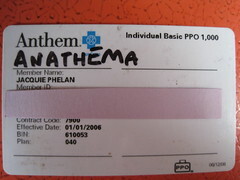 Why we started with Anathema in the first place? Because Kaiser is harder to reach by bicycle…. ~ by jacquiephelan on February 21, 2010. The reason mandatory health insurance for all will NEVER pass is because there are too many of us needing health coverage who cannot currently get it, and adding all those folks to the rolls would basically collapse one or more facets of our free-market economy: consumer spending, government funding, or health insurance companies who would suddenly have to approve treatments for millions more. If any one of the three legs falls down, the economy falls down, hard and treacherously and quite suddenly. Better to let it bleed slowly and allow more people to stay alive for longer. This is one of those days I am almost GRATFEUL for having a pre-existing condition that regularly gets me denied health coverage. If I can’t get it, I don’t HAVE to get it — and am therefore free to do whatever I need to do to cobble together a life without undue government intervention. Better to work under the radar than to be forced to buy into a broken system. I doubt I will have any health coverage until Medicare kicks in — and I’m not really counting on there being much of that by the time I get old, anyway. I will ignore the problem until it eats me up and I die. Meanwhile, I am having a good life filled with love, laughter, family and friends. If my good life ends with one bad day, well, I can’t argue too much. as a self employed person I know the cost of buying your own health insurance Mine has doubled since last year. the hell of it is that some day I may need a transplant (kidney) and by the time that happens they will have drained my coffers with there increases I have a $5000.00 deductible and for 3 people I PAY $3600.00 PER MONTH this can not go on for ever. I’m tempted Just to invest $4016.00 each month in High risk stocks the chance for success seems better to me. I do not believe that mandatory health care will bring down the ship. Insurance companies will have millions of new insured. What it means is the ship needs to be leaned out. Unnecessary procedures will be gone. Can they do that? My hope is that they will. Do they want to? WE know that answer. To me the question morphs into “what sort of a country is the USA?” debate, and my take is we are NOT a 1st world country, as evidenced by Beth’s attitude that we must let “the poor” die because there are too many of them, as opposed to the first world attitude of Cory and Jacquie, which says we are all in the same boat(the USA) and can help each other. We are a rich 3rd world country, as evidenced by the condition of education and health care. We have chosen(not me, but enough idiots voted for Bush) to pour out our wealth in the sands of the Mideast on Chinese borrowed money rather than care for our own citizen’s health and education. A path that will bring us to resemble Brazil more than any European country. The health cartel consumes more of our gross economic product than almost any other country, yet we are powerless to stop it. The real leader of America is Rupert Murdock. The proof is in how well he has brainwashed the public. Not since Hitler has a great country been so debased. !/2 of my gross income goes to my health insurance. How long ’till they want a pound of flesh as well? @ Doug — sorry if my cynicism wasn’t clear on that. Letting the poor die is not MY ideal reality, but one that gets played out regardless because of the stupid health care policies (or lack thereof) our country has. In order to enact human health care policies you have to begin with a sense of social compact that I think is historically missing from the collective American Psyche. Sadly, the system we have in place now cannot be dismantled wholesale or vastly improved because there are powerful forces who benefit from keeping things just the way they are. It’s not right and it’s not fair, but it’s the way it is and frankly I don’t see any hope for meaningful change in the future. So I am cynical.